In 2002, the rivalry gained some momentum as the game winner would represent the Western Division in the SEC Championship Game. The game (called "Miracle on Markham") was won by Arkansas on a last second touchdown pass by Matt Jones. 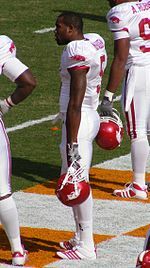 In 2006, the Tigers snapped the SEC West champion Razorbacks' 10-game winning streak when they beat Arkansas in Little Rock, 31–26. 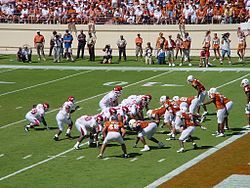 In 2007, Arkansas stunned top-ranked LSU in triple overtime, 50–48, giving them their first win in Baton Rouge since 1993, and their first victory over a top-ranked team since beating Texas in 1981, winning back the Golden Boot trophy (after 4 consecutive seasons in the hands of LSU) in the process. 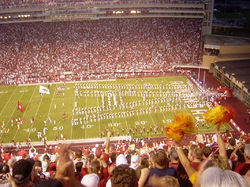 In 2008, the Razorbacks defended the trophy, winning 31–30 on a last minute touchdown drive. LSU currently[when?] leads the series 40-22–2. * denotes Consensus All-Americans. Source: "History, Honors and Letterman" (PDF). Hogwired. Archived from the original (PDF) on May 17, 2011. Retrieved 2008-01-12. ^ a b "All-Time Grantland Rice Trophy Winners". Football Writers Association of America. Retrieved 2007-12-31. ^ Kirlin, Bob. "Helms Athletic Foundation/Bill Schroeder National Champions of College Football 1883–1982". Retrieved 2007-12-31. ^ Kirlin, Bob. "Coaches' polls (UPI 1950–1990, CNN/USA Today 1991–present)". Archived from the original on January 5, 2008. Retrieved 2007-12-31. ^ a b c "Arkansas Razorbacks – History". Archived from the original on January 1, 2008. Retrieved 2008-01-13. 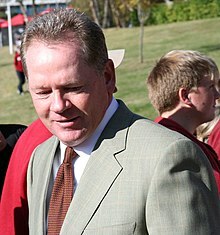 ^ "Razorback Football Coaching History". Arkansas Razorbacks Sports Network. Retrieved 2008-01-11. ^ "Arkansas : Series records". mcubed.net. Retrieved 2008-05-14. ^ "Battle for the Golden Boot – LSU vs. Arkansas". LSUsports. 2007-06-07. Retrieved 2008-01-13. ^ "Jones to Birmingham leaves Tigers stunned". ESPN. Associated Press. 2002-11-29. Retrieved 2008-01-13. ^ "No. 9 LSU ends No. 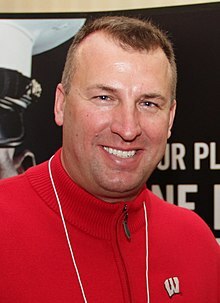 5 Arkansas' national title hopes". ESPN. Associated Press. 2005-11-24. Retrieved 2008-01-13. ^ a b "Arkansas Records by Team". College Football Data Warehouse. Archived from the original on December 14, 2007. Retrieved 2008-01-11. ^ "Arkansas-Texas A&M to Renew Football Rivalry at Dallas Cowboys New Stadium" (Press release). University of Arkansas Athletics. 2008-03-10. Archived from the original on May 17, 2011. Retrieved 2008-03-10. ^ "Arkansas' McFadden named Walter Camp Player of the Year". CBS Sports. 2007-12-06. Archived from the original on 2012-07-09. Retrieved 2008-01-11. ^ a b "All-Time Outland Trophy Winners". Football Writers Association of America. Archived from the original on February 4, 2008. Retrieved 2008-01-11. ^ "Walter Camp Football Foundation Awards". Walter Camp Football Foundation. Archived from the original on July 28, 2011. Retrieved 2008-01-13. ^ "All-Time Eddie Robinson Coach of the Year Winners". Football Writers Association of America. Archived from the original on January 9, 2008. Retrieved 2008-01-13. ^ Hickok, Ralph (2007-12-17). "Consensus Football All-America Teams from 1937 through 1976". HickokSports.com. Archived from the original on April 2, 2015. Retrieved 2008-01-13. ^ Hickok, Ralph (2008-01-12). "Consensus Football All-America Teams from 1977 through 2002". Hickoksports.com. Archived from the original on February 23, 2002. Retrieved 2008-01-13. ^ "College Football Hall of Fame: Hugo Bezdek Profile". National College Foundation. Retrieved 2008-05-11. ^ "College Football Hall of Fame: Wear Schoonover Profile". National College Foundation. Retrieved 2008-05-11. ^ "College Football Hall of Fame: Clyde "Smackover" Scott Profile". National College Foundation. Retrieved 2008-05-11. ^ "College Football Hall of Fame: Francis "Close the Gates of Mercy" Schmidt Profile". National College Foundation. Retrieved 2008-05-11. ^ "College Football Hall of Fame: Lance "Bambi" Alworth Profile". National College Foundation. Retrieved 2008-05-11. ^ "College Football Hall of Fame: Frank Broyles Profile". National College Foundation. Retrieved 2008-05-11. ^ "College Football Hall of Fame: Lloyd Phillips Profile". National College Foundation. Retrieved 2008-05-11. ^ "College Football Hall of Fame: Bowden Wyatt Profile". National College Foundation. Retrieved 2008-05-11. ^ "College Football Hall of Fame: Chuck Dicus Profile". National College Foundation. Retrieved 2008-05-11. ^ "College Football Hall of Fame: Billy Ray Smith Profile". National College Foundation. Retrieved 2008-05-11. ^ "College Football Hall of Fame: Wayne "The Thumper" Harris Profile". National College Foundation. Retrieved 2008-05-11. 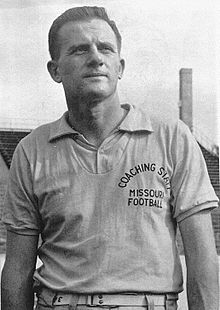 ^ "Former Razorback Head Coach Lou Holtz Elected to College Football Hall of Fame" (Press release). Hogwired. 2008-05-02. Archived from the original on May 17, 2011. Retrieved 2008-05-11. 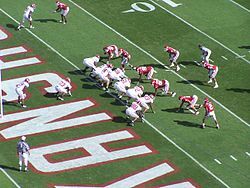 ^ "Arkansas Razorbacks Football Schedules and Future Schedules". fbschedules.com. Retrieved 2017-09-14.